North Carolina families are you ready…. it’s that time again! 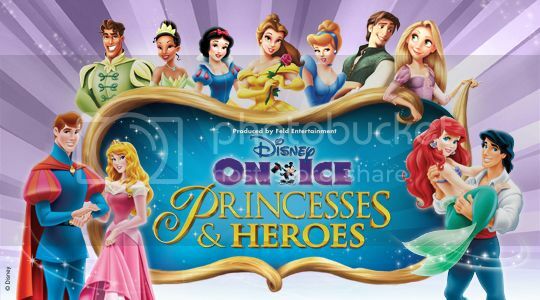 Disney on Ice Presents Princesses & Heroes on Oct 1-5 2014 at the Time Warner Cable Arena in Charlotte, NC. My family and I have attended Disney on Ice shows in the past and we have always had so much fun! We will definitely not miss this one, especially since my daughter’s favorite princesses will be there. There will be 9 performances of magical moments to make some family memories. Enter a world where heroes and hearts prevail. Join Ariel as she explores life above the waves and Prince Eric as he breaks Ursula’s spell to reclaim his true love. See Prince Phillip, in a race against time to rescue Aurora, defeat evil Maleficent. Discover a whole new world with Jasmine and Aladdin. And watch in awe as the dreams of Cinderella, Belle, Snow White, Rapunzel and Tiana all come true. High-flying jumps, breathtaking skating, and lovable Disney friends are a wish away at Disney on Ice Presents Princesses & Heroes. Charlotte families here is your opportunity to enter our 4pack ticket giveaway. Mami 2 Mommy has (4) tickets to giveaway to (1) lucky family to see this fun filled show on opening night October 1 at 7pm. My husband and I visiting Disney World with some friends. We had the best time. My favorite memory is when I did a behind the scenes tour a few years ago. At the time one of my good friends was Alice. It’s cool to say I know Alice. Oh you know Zoe would be over the moon to go watch this one! We go to Disney every year! My daughter is addicted! My daughter loves Disney princesses – we know all the songs! We go to Disney every year – we are addicted!